A Texas House committee Tuesday approved legislation to allow handguns to be carried without a license, with two Democrats voting against and five Republicans voting in favor even though they believed the measure doesn’t go far enough. • To carry without a permit, gun owners would have to meet the restrictions to obtain a license to carry, which is generally available to those who are 21 or older, have no felony convictions and are eligible to purchase a weapon under federal and state laws. The earlier version allowed guns to be carried by those 18 and older. • Churches and places of worship would be removed as prohibited places to carry a gun, although signs banning guns would be allowed. • Openly carried handguns would still be required to be kept in a holster, but HB 1911 would omit the requirement that it be a belt or shoulder holster. 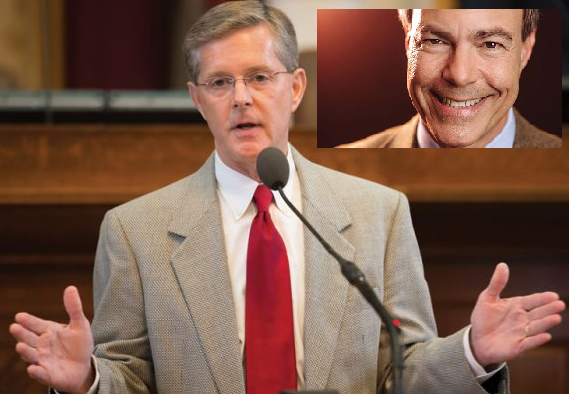 The revised bill by Rep. James White, R-Hillister, would not change any laws related to campus carry, a statute passed in 2015 that allows licensed gun owners to carry concealed weapons into most areas of public universities, said Rep. Phil King, R-Weatherford. In addition the bill, as it currently stands, prohibits anyone who's been CHARGED (note: not convicted, charged) with a class A or B misdemeanor over the past five years from carrying. 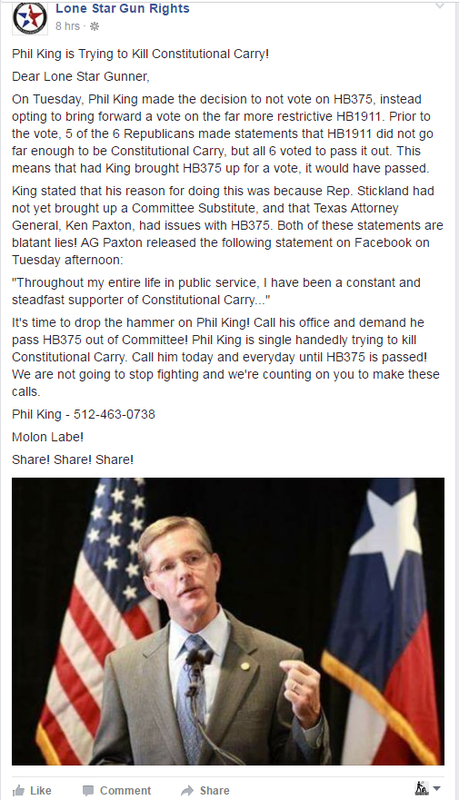 Chairman Phil King had been working with Reps. White and Stickland for the last couple weeks, discussing changes he wanted to see to both bills before he would allow them out of his committee. According to activists, a deal had been reached last week between White, Stickland, King, and group leaders, but they say the deal was breached with Tuesday's vote. They say White had agreed to strengthen his bill. They say that all parties had agreed to accept these changes and support White's bill. But in the days before the vote, King decided he would only allow White's bill to pass if White agreed to undo the agreed-upon changes. There's a small chance the bill can be strengthened via floor amendment, but there's a long history of the lawless house leadership making up excuses to refuse to consider amendments. Bottom Line: As it currently stands, HB 1911 is not a constitutional carry bill. It's a fee reduction bill. Don't get us wrong, a fee reduction bill would be an improvement on the status quo. It might be worth passing. But it's not constitutional carry. And you shouldn't believe anyone who attempts to tell you otherwise.